While driving up (north) Ruston Way, I found this old waterfront area with a public walkway to an old lumbermill long since burned down. 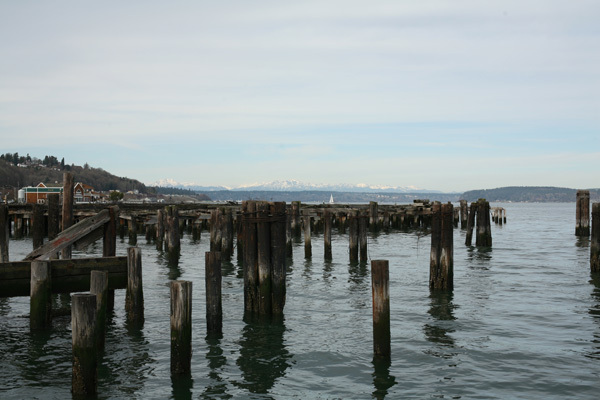 So I jumped the fence (allowed) went to the edge and setup to get both the old pilings and the beaufy of the Olympic Mountains in the distance. I used the 210mm lens this time to get more of the mountains in the distance, but the difference between the lenses is small. I used the Canon 5D in different metering modes and especially spot metering to get the range of light, and the Sekonic L-358 light meter to get the incident light. I forgot my 1-degree spot meter attachment for the Sekonic. Something to rememer to add to the camera bag. Ok, so what did I get? A point before I go there. My brain wasn't fully thinking to find where the middle zone was, ok I also forgot my gray cards. Not smart. Anyway, there was a 4 f-stop range from the piers in the foreground and the sky, from 1/12th to 1/100th at f22. So I decided to try a range of shutter settings at f45, from 1/4th to 1/30th of a second. I won't know the result until I get the sheets back to view them. And the lessons learned for the day? I learned the mechanics of taking the shot is routine, from the setup, setting everything initally level, to the exposure, cocking the shutter before removing the film cover. I need to work on the exposure, determining the optimium and any range I want. I was experiencing brain fade when I took this series. I need to remember the gray card and spot meter attachment. So I took a total of 6 exposures, and 150 digital exposures. That's 10 images to date with 10 black and white and 10 color (Provia 100F) to take before I take the boxes in for development. The color images will easier as you have less latitude and you can use exposure from the 5D or 35mm film camera for the settings, something I'm more familar with my film camera experience.